Noro viruses are positive single stranded RNA viruses of the caliciviridae family. The human-pathogenic strains cause the norovirus gastroenteritis in humans. 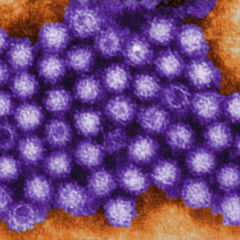 The norovirus was originally named after Norwalk, a city in Ohio. In 1968 there was an outbreak of gastroenteritis in an elementary school of that city. In 1972 the virus was imaged for the first time using an electron microscope. It was officially named norovirus in 2002. Noroviruses can be separated in to 5 different genogroups (GI – GV). Humans are effected by viruses from the groups GI, GII and GIV. These groups can be further subdivided into various genotypes. The majority of norovirus infections in adults are caused by the genotype 4 of the genogroups II (GII.4). The viruses display a strong ability of antigendrifting as well as season antigenshifting. This results in the formation of numerous variants of the virus. Noroviruses are single stranded RNA viruses with a diameter of 35-39 nm. 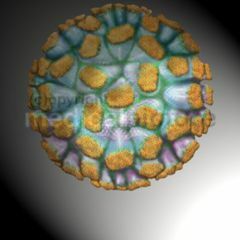 They possess an icosahedral capsid and display as a blurred, circular structure in the electron microscope. 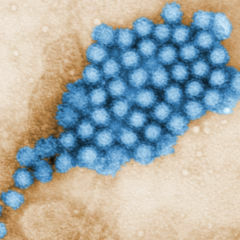 The norovirus genome has a size of approximately 7,3 to 7,7 kB and has many variable gene sequences. The viruses have a high tenacity against chemical and physical environmental influences. They can survive in a temperature range from -20°C up to +60°C. Noroviruses are not limited to a specific region and can be found world-wide. The natural reservoir of the human pathogenic virus strains is the human. The seasonal summit of infections is typically during the months from October to March. However, cases can occur year-round because of traveling. Infections present typically as endemics in public institutions (kindergartens, hospitals, nursing homes). The high resistance and infectiousness of the virus make it very difficult to control. After transmission the noroviruses reproduces mainly in the small intestine. After roughly 1-2 days the first symptoms become present. These symptoms of an acute gastroenteritis include: Nausea, vomiting, liquid diarrhea and stomach pain. Sometimes there is also a loss of taste. These symptoms are maintained for about 1-3 days. Further signs of sickness can be generalized weakness, muscle pains, headache headaches, coughing and sub febrile temperatures. Normally the disease heals up completely after this timeframe and leaves no impairments. The general course of illness is rather mild. Only in exceptional cases can an in-patient treatment be necessary. Very young and very old patients, as well as immunosuppressed patients are at an increased risk for a severe course of the illness. Isolated cases can lead to death, in particular if dehydration is not treated properly. 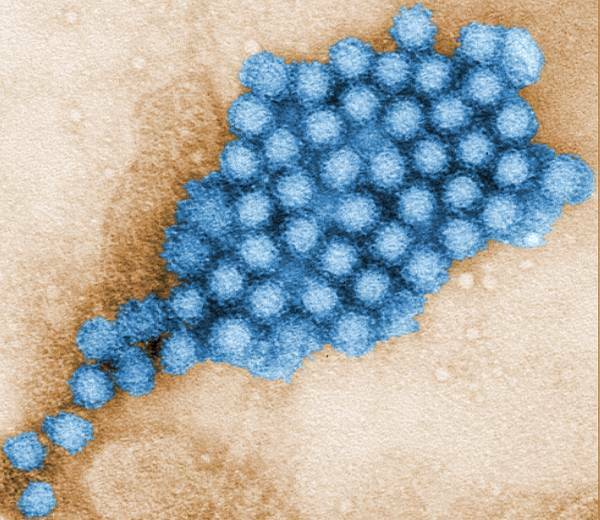 As of 2016 there was no vaccine for the norovirus available in Germany. Vaccination with recombinant virus particles (VLP) is currently in the stage of clinical testing. Oral or nasal administration of the VLP was able to induce a specific immune response and alleviate the symptoms but not prevent the infection. It is questionable if it can provide a dependable prevention of infections with newly arising virus strains. This is due to the same problematic as known from vaccinations against flu viruses.